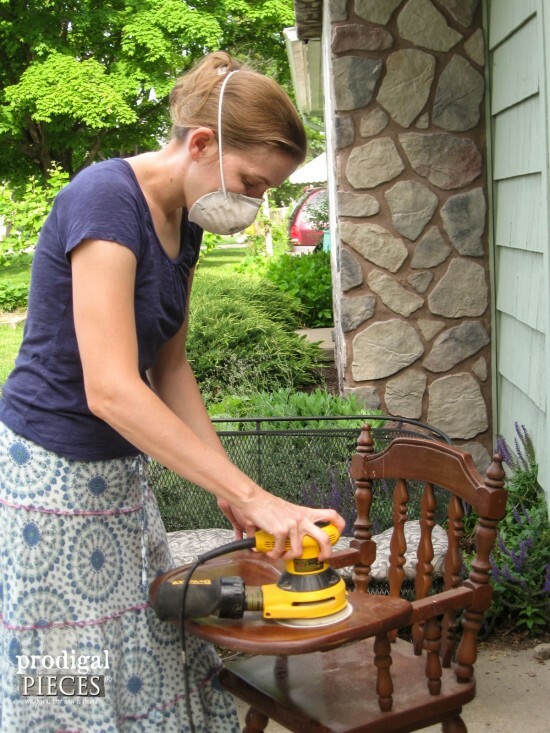 All I had to do was give the chair a light sanding with my sander , and make sure the surface was clean. How sweet is that?? Even with our gusting windy day, I was able to acheive a smooth, even coat. My video was on fast-play, but each coat only took me about 10 minutes to apply without a compressor. The best part is no drips, no messy layers, and only the sprayer to clean up, and even that was made easy by a new kit HomeRight offers, called the Rapid Clean Kit . 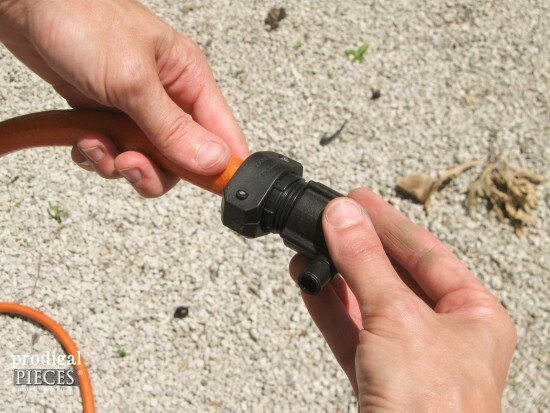 Just hook up your sprayer to your garden hose or even your kitchen sink and spray it clean. Before the cleaning kit, the sprayer wasn’t too bad to clean up, but I did have to take it apart and scrub the individual pieces (that was fine with me because I loved how easy it was to paint). Now with just a bit of spraying, I’m left with those pieces squeaky clean! WAHOO!! Once I had the highchair coated in my favorite aqua, I wanted to add some whimsy to the tray because it’s just fun for kids to feel special. My littlest was so excited watching me paint and I just had to have her be my model for this post. As soon as I set her in the chair, she kept trying to pick up the utensils. Ha! She loved getting all the attention from her brothers and sisters and didn’t want to get out of the chair. Who can blame her, right? It’s pretty, it’s fun, and ready for that special little one. 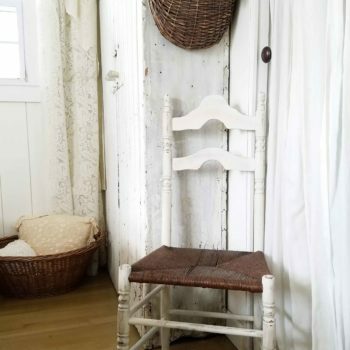 I distressed the chair a bit to create a time-worn feel. After that I applied a hand-rubbed wax finish for protection. I am very pleased with how easy this chair was to complete and was done in only a days’ time. This chair has sold from my shop, but I do take custom orders, if interested. 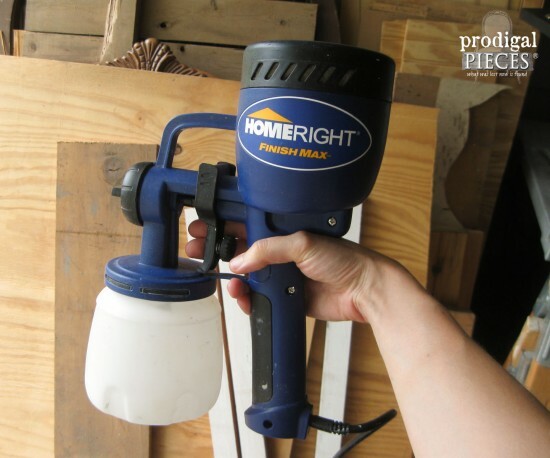 I know you’re not the only on who would like to paint with ease with the HomeRight Finish Max. Share and spread the love! I’m off to give my worn out patio set a much needed coat of paint, so head HERE for the reveal! 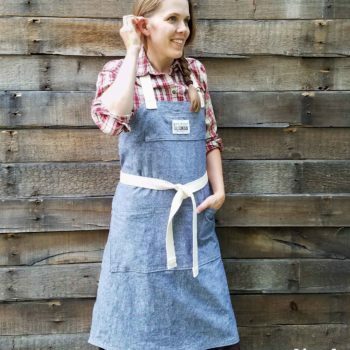 Sign up for my newsletter to get the DIY details in your inbox. Use the widget in the sidebar or at the bottom of this post. Until next time! Beautiful work! The First Thing I’d Do With The homeright sprayer would be a refinish job on a small spindle table. Thanks for the chance to win! I would paint my white picket fence with this baby!! That would be so much better than by hand! Oooh…awesome project for this sprayer! You would rock it for sure! Does it work with stain? Yes, I believe so though have yet to try it. I’m debating on my built-in bookcases…what to do? i would love to win this. I have several projects waiting to be painted! Yay! I hope you win, Jordan. I’m constantly looking for quality pieces that I can give a new life to and add to our home. But as a mom of 4 sometimes getting these projects done is time consuming. This sprayer looks like the missing piece to make all of my projects come to life.. Love the high chair. Love how the high chair turned out! Thank you, Kelly! I just love that aqua color and will hoard it forever. tee hee. I have a grey porch swing…it’s only grey because the wood is so old and it’s just ugly. I paint that!!! I have 6 chairs with spindles that need to be painted. Oh how wonderful it would be to have this sprayer! You ain’t kiddin’, Lisa! That dining set I did would have been a bear without it. This looks amazing and so simple to use! I need one in my life 🙂 can you use any paint with it? Love it! I’d love to have a sprayer to paint all of our doors and baseboards!!! I have a lingerie dresser that I am waiting to redo. That’s the first thing I would use it on. That sounds a great start, Ramie. It works on most anything! The First Thing I’d Do With The homeright sprayer would be to redo our picnic table!! Now that would be a chore with a brush for sure. Wish I had a table to paint! Thanks for sharing! I have been lost contemplating a sprayer and this one seems easy!! I really wanted one for quite some time and even have a compressor, but this one is light and easy to use – not to mention easy to clean. That’s what made up my mind. What a time saver that would be. What an amazing chair, too. Thanks for a great post! Wow! How awesome! I have been putting off projects because of spindles! I’m even so close to taking a coffee table to the dump because my current method of refinishing it isn’t working. So definitely I’d paint the coffee table. I hear you! That’s what kept me from buying a steal at a garage sale, but now I think twice and know I could just spray it. I had mine sitting for almost 2 years and just couldn’t get the nerve to brush (or roll) it all. I was giddy when I first started spraying our shutters and knew I would be using my sprayer often. Beautiful work! I would love to have a sprayer like the HomeRight Sprayer. 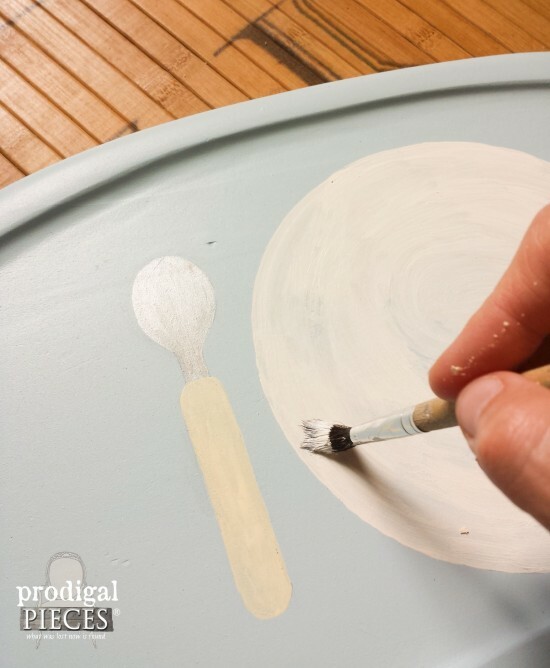 You are right – I have been painting furniture by hand and it is impossible to not get some drips somewhere! Thanks for the chance to win one! My pleasure, Renee. I’m nutty about being neat, so this has saved me stress. I’m already imagining the things I could accomplish with the HomeRight Finish Max Sprayer! Larissa, you have answered all my questions regarding this product and it is now added to my wish list. Thanks so much. You will love it, Vicki! Seriously, I’m not one to push a brand, but this one has me sold and it’s very affordable which is a big factor for our family of 8. 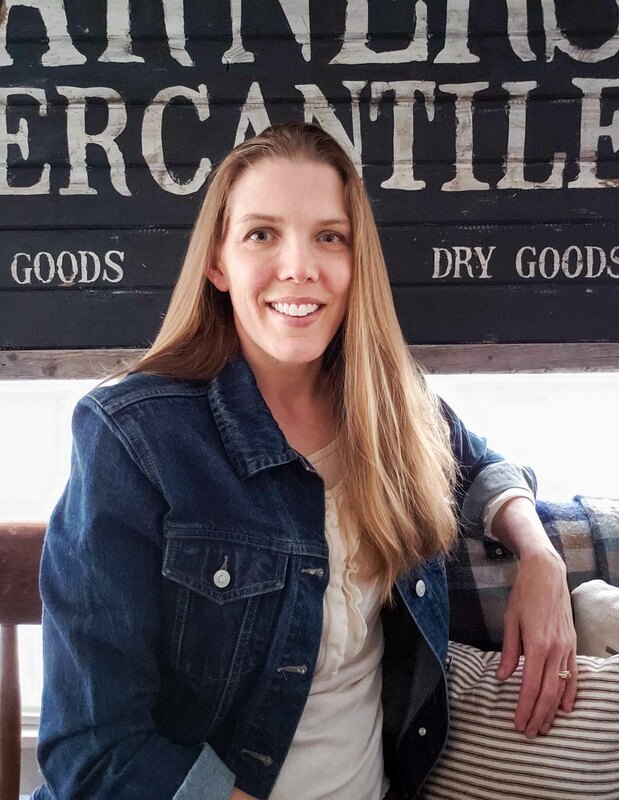 I love your farmhouse dinette set! It’s exactly what I want to do with one that I have. I have a dinette set, hutch, cabinets, and a desk sitting in my garage waiting to be brought back to life with a fresh coat of paint! Thanks for sharing! Thank you, Crystal! Sounds like this sprayer could save you alot of work. I’d love to see what you do! You did such a cute job on the high chair. . I love this sprayer. . looks much easier than the one I used to own. Would love to have one. Also. . your daughter is BEAUTIFUL !!!! Awww…thank you. Yes, she’s and all my children are my treasures. I really debated on buying one for a while because of cleanup and being able to do upside down and sideways sprays, but this does it all. Oh man! I have a half-primed hutch sitting in my garage. It took me almost a week (an hour or so each night) to get the primer on. This would make finishing that piece CAKE. I feel your pain! Cabinets are the worst for me, and I’m planning on using this in our remodel soon. Yay! My husband wants to stain the new deck. I want to stain the floor and paint the railings to match the front porch. This paint sprayer sure would help me win this one! Absolutely, Tami! This would make it so nice and even too. Fingers crossed! 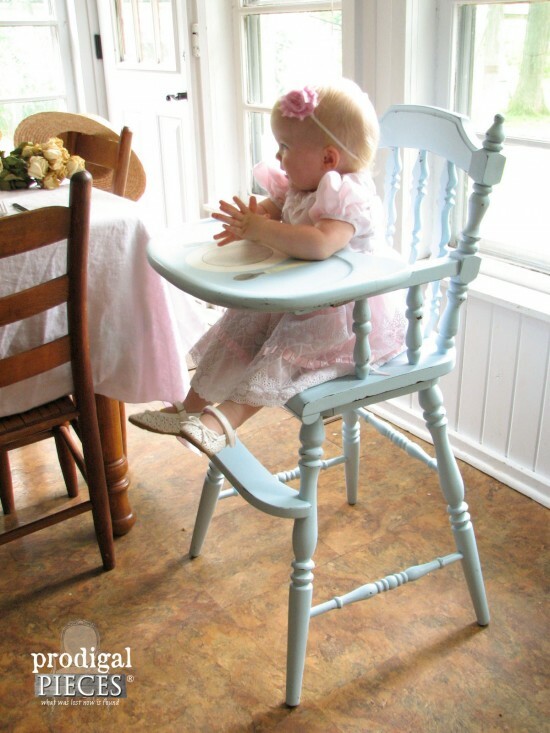 Cute idea, I have my kids highchair, not fairing so well in the attic, I’ll have to do something like this to make it grandbaby ready in a few years. I have had my eye on one of these for a while. I have four caned back dining chairs that would be my first subjects to paint! That would be instant fun! Caning is a pain to paint and I wouldn’t do it any other way. How sweet is this! I’ve been wanting a paint sprayer like this for so long! I have SO many things I want to paint and I have been putting them off because of all the work it involves. I could do them all with this sprayer. I sooo want this sprayer!!! I have a cabinet I’ve been wanting to refinish! I would love to win so I can! 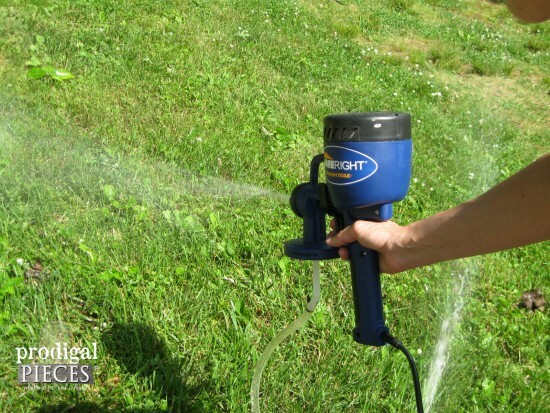 That is a dream come true…it looks so easy….I have never used a sprayer. This was my first and was really easy to figure out. They even have free online videos for you to see if you need a tutorial. Love what you’ve done! Looks like an amazing product to make life a LOT easier! Yes, indeed. Spraying is fun and quick results for sure. Thank you! I have a wicker chair and small wicker table to spray paint. This would make it so much easier for this old gal! How adorable is your little girl Larissa! Love that she was trying to pick up the painted utensils (which are an adorable touch BTW). I love my HomeRight paint sprayer and don’t know how I lived without it! 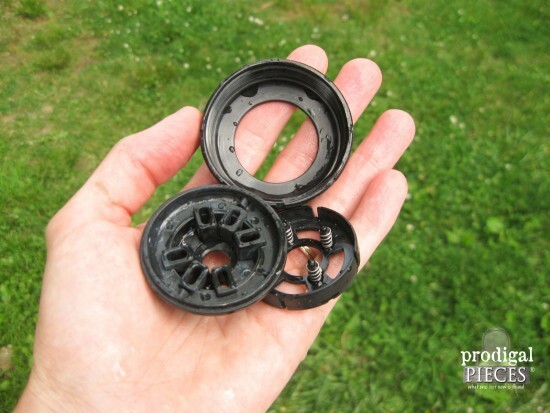 I’m definitely going to order the cleaning kit even though it’s pretty easy to clean the machine without but like you say, not having to take apart the nozzle pieces would make the task much quicker (I wasn’t blessed with the patience gene). Looking forward to seeing what color you spray your patio set with. Wow! So handy!! Can this sprayer be used with polyurethane or varnish? Yes, it can! My table post explains how I used poly as a topcoat, and let me tell you that would have been an awful chore. You would love this for your task! That sprayer makes it look so easy! I would love to have one. 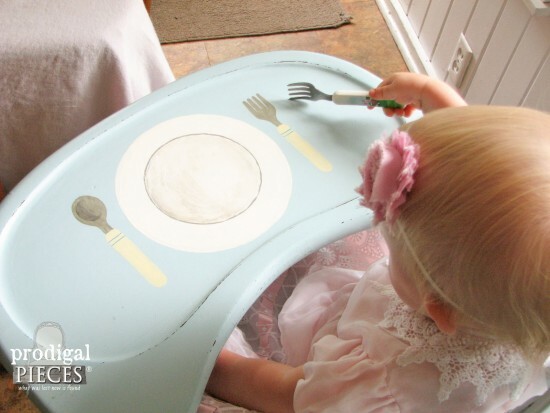 What a beautiful highchair makeover. So cute!!! I would absolutely love to win this paint sprayer. The first thing I would paint is our vintage metal patio furniture. The set is currently red, but I would love to give it a bright & cheery YELLOW makeover! OOOH! That looks like a great way to spend an afternoon! First thing I’d tackle is an old dining room hutch/buffet, with lots of grooves and slats – this would work great! I paint tons of things and this would be so nice to have! Thanks!! Oh this would make my life a whole lot easier. Especially since I like to put on several layers of paint and then distress. I guess if it is meant to be… here’s to hoping! Thanks for the opportunity! I would paint this lovely old hutch that has been in my shop for a year now. And then, find a high chair to copy what you did on this chair for my grandson who is due July 4th! 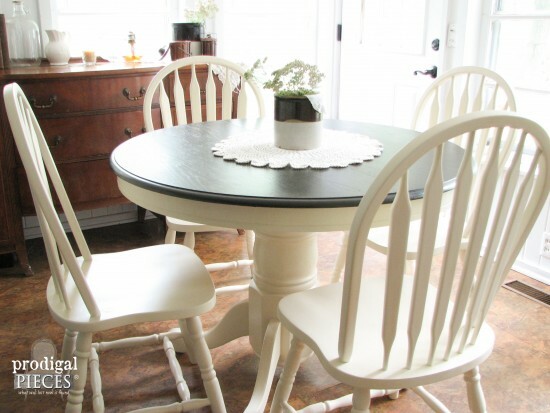 I have a antique dining table and 6 chairs to paint for myself…I need this!!!! LOVE !!! Would love to win this! I have lots of dark furniture that I want to paint. I would paint the whole inside of the house! Love this so much! Beautiful work. 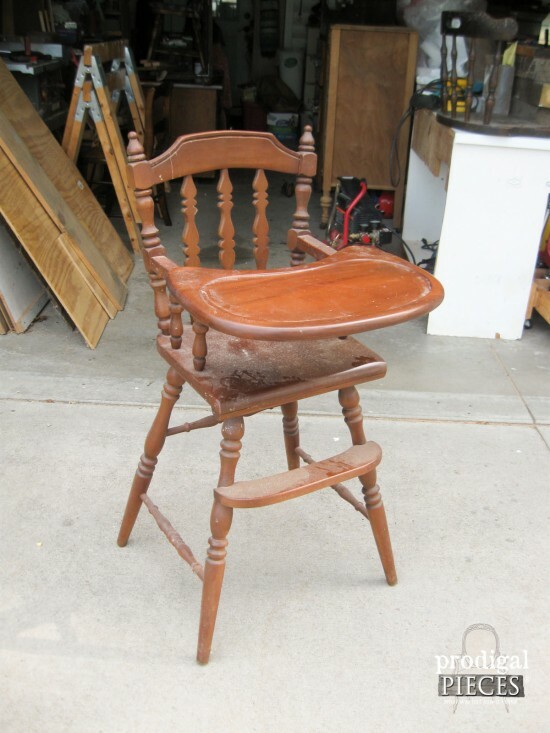 I actually have a highchair in my garage that I need to paint. Would love to use this sprayer. 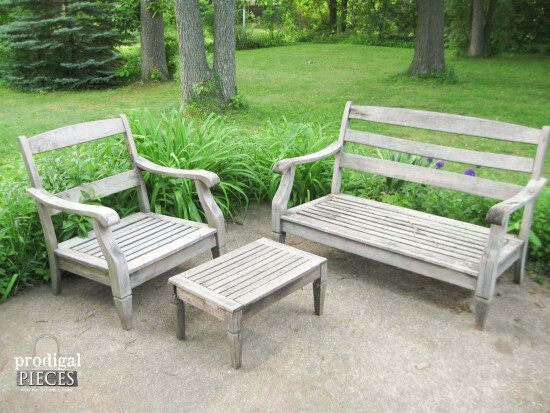 We have several twin bets sets that have turned posts that we make into benches…this would make it so much easier! I’m all the time painting something… I could paint lots more with the time I’d save! Would love to win for sure! Thanks for the opportunity to win one! items – coffeetable, lamp, outdoor chair. Would love to have this tool to add to my growing collection. Got a bureau that is waiting to be refurbed. Thanks for the chance! I think I’d choose to paint our 2 front shutters first. I need to paint my bedroom set and need a sprayer to tackle the challenge. I have a kitchen table and chairs that need this sprayer! 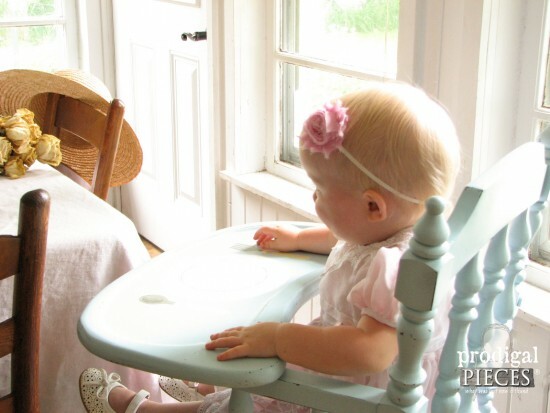 That high chair is so darn cute! Great color! My brother built me a large workshop/craft table and I’d use the new sprayer to paint it. What wouldn’t I paint if I had the HomeRight paint sprayer 🙂 the possibilities are endless! I NEED this sprayer to finish 2 bamboo chairs I’ve had it the garage forever! would love this sprayer! I have a bench and some rocking chairs that need refinishing badly. I would paint my dining room table i bought on craigslist for $50! Its a butcher block top with ugly forest green legs! Lol! My parents gave me an 1970’s china hutch. I hate it! I cannot stress enough the word “hate”. But I know it would break my mom’s heart if I got rid of it. It has been long enough and needs a vibrant color change! I would paint the headboard I got at a flea market for my son’s bedroom. It has a lot of little spindles!! Then I would paint my table bought on a garage sale! The first thing I want to paint is about 8 bowling balls that are waiting to morph into lady bugs. I could really use a paint sprayer like this, thanks for the chance to win. Love that color and the high chair. 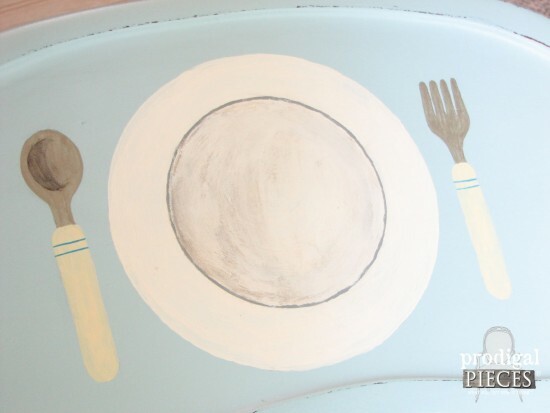 What a cool idea to add the plate and silverware for a touch of whimsy. I’ve wanted one of these sprayers for so long! The first thing I’d paint with it is the headboard for my youngest son’s bedroom. I would love to use this!!! I would paint an antique dresser that I use as a TV stand. 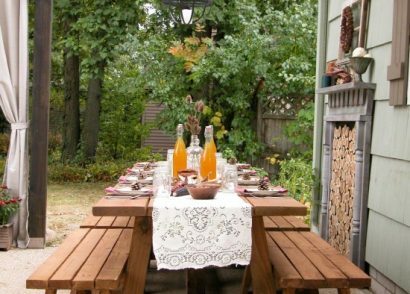 The 1st thing I would paint would be my outdoor furniture. It’s needed it forever and still I procrastinate! My list is long…this would definitely help shorten it! Thanks for the opportunity to win one! Your high chair turned out amazing! 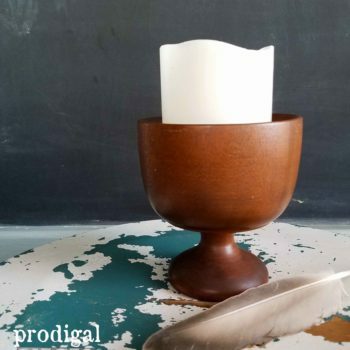 You always do such awesome job on your prodigal pieces! Thanks for the chance to win such a cool tool! I would paint my new (and only) grand baby’s crib… You’re right those spindles are crazy! LOVE the high chair! I love to follow your amazing work! So happy to hear it, Sarah! The first thing I would do is paint two barstools. Spindles are HARD!!! Hello! Thank you for sharing your honest info on this sprayer. I have been wanting to upgrade to a sprayer from brushes, but there are so many out there, it’s great to get a personal review! The first thing I would paint is a large china cabinet hutch I have been wanting to update it to an emerald green but afraid it would come out to streaky with a brush. Thanks again for the honest and helpful review! I would paint several chairs and some end tables. I would be so excited to win such a wonderful tool! Your high chair turned out fantastic! I was just telling my husband how happy one of these would make me! I would paint everything in sight! Picnic tables first…those are a real pain. Beautiful chair and that sprayer really does look like it makes it effortless. First I would paint my dining room chairs! But I would use it a lot! I love to paint furniture!! The first thing I will paint with my new sprayer is a china cabinet that has been stashed in my garage since last November. It’s a daunting task to tackle with a roller and foam brush. It WILL be lime green! I would paint the 1920’s buffet and table in our dining room. They would look so cute in a glossy black! I love the high chair and homeright makes painting so much easier. I love this product. That chair is adorable! I would tackle doors! Lots and lots of doors. The first thing I would tackle would be my radio cabinet, the second would be my grandmother’s 100 year old cedar chest that was ruined by being in my parent’s attic. After that, I’d paint my deacon’s bench and my dining table…..I’m so behind in everything! 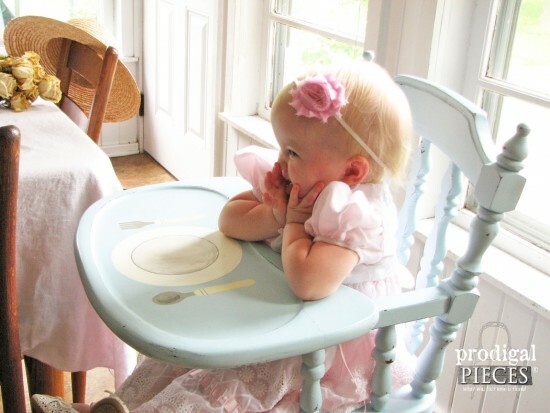 That aqua is such a pretty color for a high chair, and your little model sure makes it look even cuter. I am just itching to get a paint sprayer! Thanks for the chance to win. 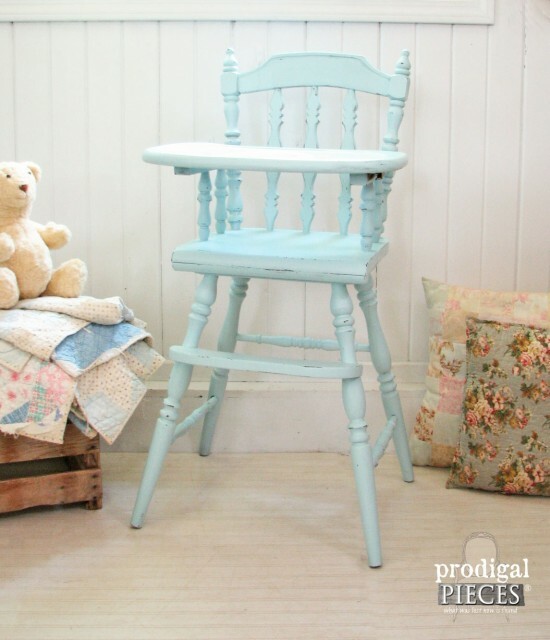 That chair is adorable and the aqua paint is to die for… did you ever get the formula? Great job on the faux place setting, too. I have about a zillion things that I need to paint and a sprayer would be a great help. Thanks for the chance to win! My daughter and I have projects to do! 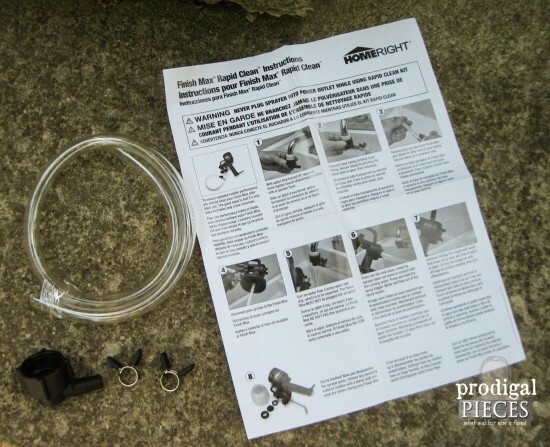 The HomeRight Finish Max Paint Sprayer would be wonderful to use on them! The highchair is so cute! The first project I would work on would be a china cabinet that I picked up and it’s sitting in my kitchen taking up space. Great give -away! This would revolutionize my projects. So many projects so little time. But coffee table that’s been sitting in the garage is the first thing! First thing I would paint is the beast of a dresser I have to finish up! I have a dresser and a bed frame i would love to repaint to match my sons bedroom…. I have so many things stashed away because I just don’t want to get the mess of painting even started. This nice little jewel would make everything get finished and out of my husbands way in a flash. What fun !!!! I just purchased a small, old, neglected, wrought iron rack with lots of detail, twists and turns and I would love to have a sprayer such as this to give it a new chance at life! I have a Jinny Lind bed that I would love to try to spray! Great Job and thanks for the opportunity. 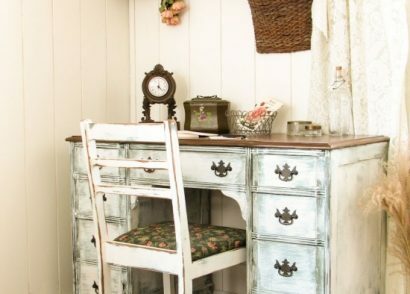 I rescued an old roll top desk out of a barn and want to re-finish it for my craft room and make it my new desk. Even if I do not win this awesome tool I will buy one to get my project done. Been wanting this paint sprayer for some time now! If I won I would be on the hunt for the perfect project in Brimfield in a few weeks! I would love the opportunity to give this sprayer a try! Thanks for the giveaway. I have been dreaming of owning one of these to do so many projects!!!! Hard to pick what would be first….re making an old oak entertainment center into a dresser for my master bedroom. I would love to use this sprayer to paint my dining room table and 8 matching chairs. I have either a dresser that was mine as a kid or a bookcase that I’d love to use this on! Thanks for the giveaway! Do you find you need to thin your paint often as described in the instruction manual? I live this project! I found you via Pinterest. I have a question. You wrote that you did this without a compressor? So what did you use to spray the paint with? I’m in The market for a paint sprayer so any advice would be great! Thanks so much! Happy to hear it! You just use the sprayer I used in the video. Just fill the cup and have at it. Hope this helps! 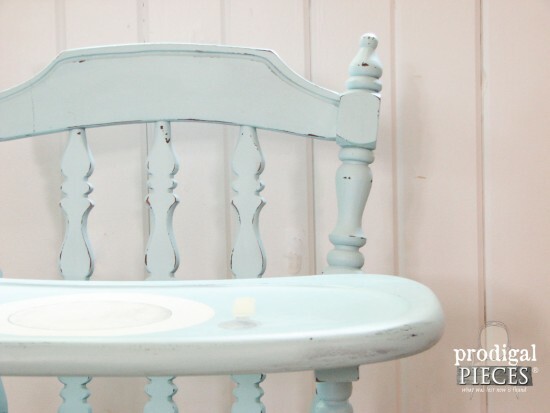 I am in love with the aqua paint color that you used on your high chair. Did you ever find out what color mix it is. I just really, really love, need, gotta have that color. It’s perfect for a book shelf I want to paint. Not yet, and honestly, I’m considering making it one of my custom colors. I am still using up my gallon and plan to get more soon as it’s getting old. I would liken it to water, a cool pool, if you will. 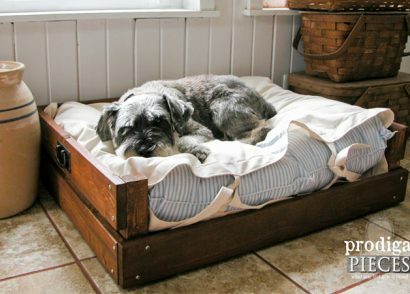 This would be the perfect tool to update a baby bed and some other pieces I have on hand! Oh my, yesss… It would be a lifesaver for sure! i would love to have one of those sprayers! What a nice finish it gives…and time saving and easy clean up,is a real bonus. It really changes the game up and makes life easier. I have 6 dining room chairs that I need to paint and I’ve been putting it off because I dread it. This sprayer looks like it would sure simplify the job to where it would actually be fun. 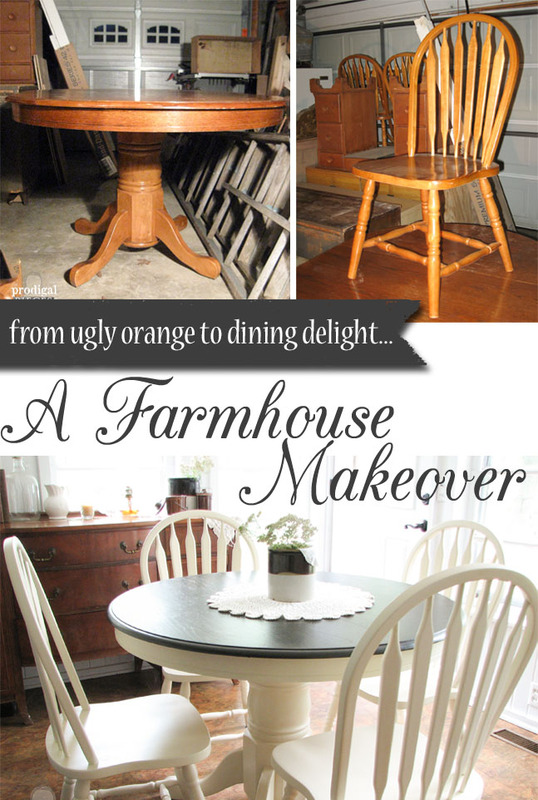 Seriously I was giddy when I did that dining set I have at the top of this post. I couldn’t believe how easy it was and it got me hooked. No more drips and certainly a time and aches/pains saver. I just purchased the homeriggt sprayer and cleaning kit and cat to use it. But my husband has a question, did you need to water down the paint for the sprayer? Yay for you! Each paint is different and should have thinning insrtuctions on the side of the can if needed. Hope that helps!